Science, research and decades of experience all point to the same thing, kids and adults will get active, stay active, and even reach the greatest heights of sport achievement if they do the right things at the right times. Equestrian Canada's Long Term Equestrian Development program (LTED) aims to define an optimal training, competition and recovery program based on biological age rather than chronological age. It is athlete-centered, coach-driven, administration and sport science supported. It is designed to promote sequential equestrian development that targets specific stages for improved growth in our athletes. This program's target goals are to improve the overall health, well-being, and athlete potential while encouraging life-long participation in equestrian sport. 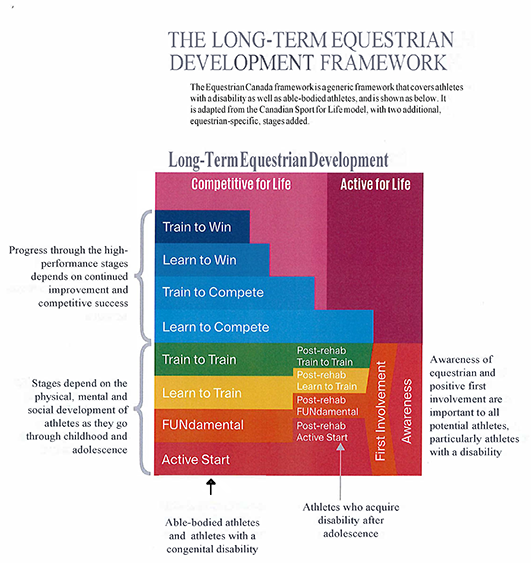 The Long-term equestrian development model provides a framework for training, competitions and recovery that is based on the development stage of the athlete rather than the chronological age. 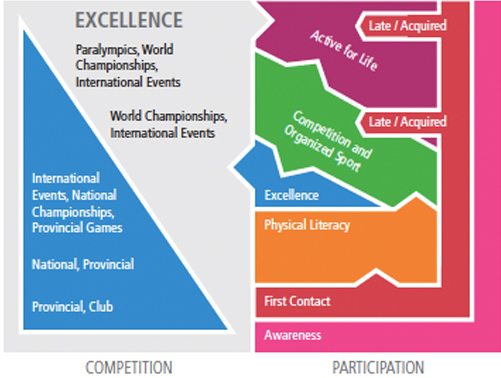 The Para-A thlete's long term athlete development model has two additional LTED stages—Awareness and First Involvement. These additional stages are particularly important for individuals with an acquired disability who may not have been aware of sport and physical activity for persons with a disability. Athletes who retire from Para-equestrian competition are encouraged to remain involved in equestrian sport at the Active For Life Stage as a coach, instructor, official, mentor, volunteer, and participant.